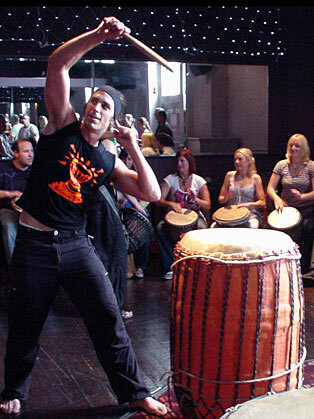 BassToneSlap are the drumming team building provider of choice, the business that designs and implements experiential marketing campaigns through rhythm and percussion and a business known for putting skills back into the wider community by satisfying their clients CSR obligaitons. BassToneSlap will provide musicians that are fully aware of the bigger picture of your event, they believe that success is drumming through life, success is growing a passion into business and success is sharing the positive health benefits created through drumming with the world. All of the team building facilitation and performances are delivered by skilled musicians and performers who have been, and will continue to be carefully sourced. The aim of this is to maintain and exceed a professional standard of facilitation and performance and to pass on relevant and accurate knowledge. Just wanted to send you a note, on behalf of American Express, to thank BassToneSlap for your infectious enthusiasm, professionalism and astounding energy this weekend. Every member of the public I spoke to had an amazing experience (as did all the Amex team who attended) which wouldn’t have been possible without all your hard work. We try to arrange something every year for staff and in the 6 years I’ve worked for Freestyle this is undoubtedly the best Company Day we’ve had. Your performance provided the ATCO PSA World Series Squash Finals with just the right amount of excitement and enthusiasm needed to boost the energy of our spectators at the Queen’s Club this January 2013. Thank you for your energetic contribution to the event, which was thoroughly enjoyed by all… We hope to be able to have you back next year!